One of the upshots of this summer’s glorious weather for many of us was the increased time spent outdoors, away from screens, devices and technology in general; time spent with family and friends, engaging and interacting more in the offline world. With this in mind, it is interesting to consider how the offline and online experience complement each other as part of the modern education and learning experience, the balance between the two experiences and how much things continue to change from what for a long time has been considered the norm. There has been a lot of discussion surrounding the rise of online and virtual learning and it is exciting and inspiring to hear about the many ways education can be accessed through technology. No longer are today’s learners hamstrung by physical offline location or finances if they are happy to learn virtually. As well as being integral to the learning process, technology is opening up completely new ways to learn, ways that should be embraced. There is no doubt that a blended learning approach, combining online and electronic content – in particular video – with ‘real’ lectures and interaction can really enhance the student’s experience and potentially, their results. 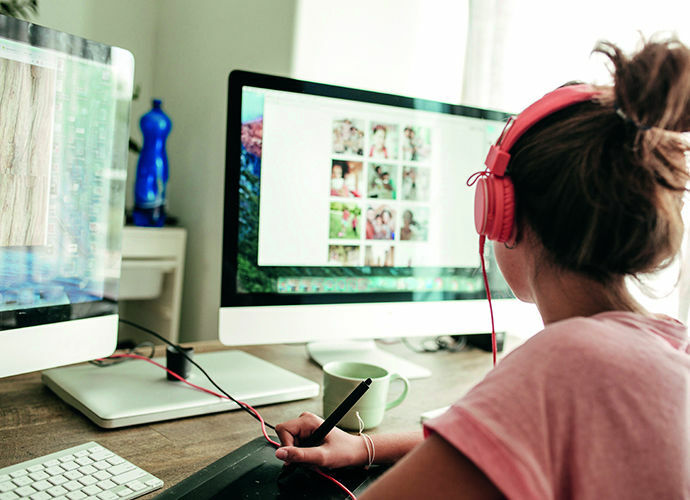 For a generation of learners bought up with content platforms such as YouTube, video has become a vital, go-to component of learning, with studies indicating that 95% of students and educators say that video content is essential for digital literacy. The flexibility to be able to prepare for classes and learn by accessing online resources and tools such as modules, articles, or recorded lectures that can be repeatedly viewed at one’s convenience, is a far cry from the previous, more traditional approach when everything outside of the classroom environment was paper-based and often inaccessible. Video can also offer interactive, non-linear ‘branching’ content that works for varying learning speeds and styles; the result is students who are more attentive and more invested in what they are learning, with 64% of students saying they are more likely to engage when they have such control over content. What is also really exciting is the rise of completely online qualifications whereby students can attend a course virtually without the need to ever physically visit the university or country in question. Of course, you may say this concept has been around for years through institutions such as the Open University here in the UK; the difference now is the virtual experience, encompassing everything from MOOCs, online resources, recorded ‘on demand’ lectures and even live online sessions with lecturers. When the right content is delivered using the right technology, course quality can be extremely high, providing students with opportunities to not only learn their subject but to also easily engage and interact with new people from other countries and cultures, gaining important supplementary soft skills in the process. For universities, this presents a huge opportunity to stand out in a competitive market, offering existing or even completely new courses to students in new ways and expanding their reach and enrolment numbers to audiences on a global scale. Research indicates that 78% of educators say that online video learning technology helps to attract the right students,* as well as making a big difference to the onboarding process and overall student satisfaction scores. The increase in the availability of technology to create these courses enables universities to deliver high-quality learning on an ongoing basis at a relatively low cost. At Sony, we work closely with UbiCast, offering a fantastic suite of content and video solutions that can do just this and the response from customers using our solutions has been extremely positive. As the digital learning landscape continues to develop, we are really looking forward to working with more universities, helping them to embrace this new approach and being part of the changing world of education.